Born/lived: born in Paisley, Scotland/ Albany, NY; Troy, New York; Richmond, Virginia; Michigan, opened a studio in New York City and Brooklyn. Known: as a formidable Hudson River School artist who painted serene, bucolic, romantic landscapes, allegorical and genre paintings with smooth finely executed brush-work. 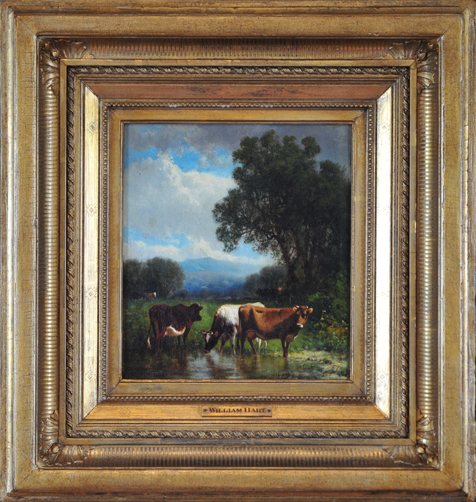 Many of his paintings had cattle and realistic figures in the landscape, a motif he began in the late 1880s when he was inspired by the Lower Keene Valley in northern New York state. Hart also painted portraits, beginning this subject matter when he was age 18. Many of his paintings are dramatic seascapes depicting the coast of Maine, especially from Grand Manan Island. Was brother and fellow painter to James McDougal Hart (1828-1901), a second generation “Hudson River School” painter, and sister to artist, Julie Hart Beers. Studied: George Inness and Asher Durand were major influences, although he was basically self taught. William apprenticed to Eaton and Gilbert Coachmakers where he painted decorative panels, then he worked as a window-shade decorator and portrait painter, working from his father’s woodshed and selling them for five dollars a piece. He traveled across the country painting landscapes. Member: In 1855, he was elected an Associate of the National Academy of Design in New York City after having established his reputation as a fine landscape painter with Peace and Plenty. In 1858, he was elected a full member of National Academy of Design and in 1865, was founder and three-term president of the American Watercolor Society from 1870 to 1873. Hart was the first president of the Brooklyn Academy of Design and also an instructor there. Exhibited: popular landscapes were exhibited regularly at the National Academy of Design and the American Art Union. He was a frequent exhibitor in New York City, Philadelphia, Boston, Baltimore and Washington. Taught: Hart was the first president of the Brooklyn Academy of Design and also an instructor there. He was a highly regarded teacher, and pupils included Homer Martin and Lemuel Miles. Work: Metropolitan Museum of Art; the Brooklyn Museum of Art; the National Gallery; Corcoran Gallery of Art; Museum of Fine Arts; Boston and in many other museums and institutions.